time consuming task, which inevitably led to increased latency. Pro M.2 series NVMe SSDs for review. In this case the 250GB M.2 NVMe version. There is also a 512GB version available, which I hope to review soon. Samsung’s own 32 layer 3D V-NAND in an MLC configuration. most Z170 chipset, and X99 chipset motherboards. solution, which is compliant with TCG-OPAL 2.0. SSD, and has the following features. given amount of NAND as a manual over provisioning area. that the SSD is a genuine Samsung SSD. feature (is not supported on the 950 Pro). over to your new SSD. 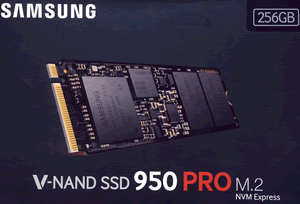 Samsung 950 Pro M.2 NVMe 256GB SSD.